The deepest component is the hypodermis, which is subcutaneous fat stored between muscle and skin. This functions as insulation and padding and is also a storehouse for nutrients and energy. other specialized cells like fibroblasts and masts; hair follicles, nerves and sweat glands all surrounded by a gel-like substance composed of moisture binding compounds called glycosaminoglycans. The top, visible component is the epidermis which is about the thickness of one sheet of paper (.1 mm) and actually made up of 5 distinct layers. The epidermis acts as a protective shield for the body keeping environmental toxins and microbes out while holding moisture in. The bottom layer is where new cube-shaped skin cells are created through cell division. This bottom layer of the epidermis is close enough to the blood vessels in the dermis to receive the oxygen and nutrients necessary for the process. Your body additionally requires a compound called Adenosine Tri Phosphate (ATP) as the energy source to fuel the conversion process which turns the available nutrients into specific compounds needed for healthy skin cell regeneration. These skin cells move up through the 2nd layer where they start to flatten out. By the 3rd layer up they are they are further flattened and drying out. Cells in his layer are too far from the dermis to receive nutrients through diffusion, so they begin to die. The 4th layer of skin, called the clear layer, is only found on finger tips, palms and bottoms of feet. 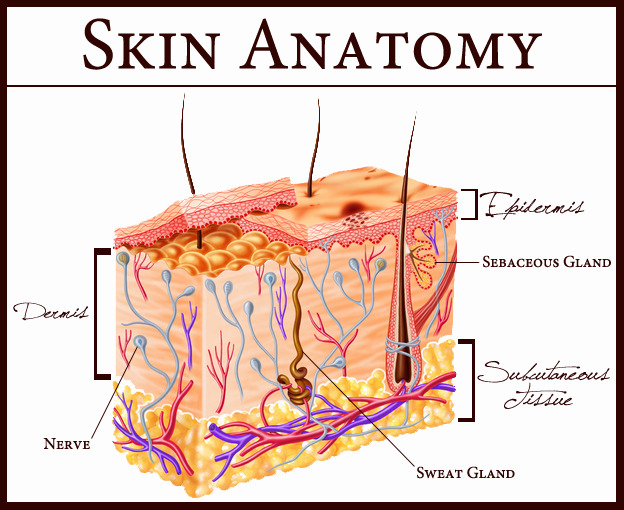 The fifth layer is the top, outermost, protective layer of your skin. It is comprised of dead cells which are continuously shed by friction and replaced with cells from below. These skin cells (bricks) are held together with fatty acid lipids that act as mortar. This brick and mortar structure forms a waterproof barrier to hold moisture in and keep invading microorganisms, chemical irritants, and allergens out. If the integrity of the moisture barrier is compromised, the skin will become vulnerable to dryness, itching, redness, stinging, and other skin care concerns. Now, let’s look at the functions and benefits of emu oil and you'll understand why it is an all-natural, powerful anti-aging oil for sensitive skin and how it works to relieve skin conditions like acne, rosacea, eczema and more. Emu Oil soaks into your skin and travels deep because it’s so chemically similar to the lipids (mortar) in your skin. Its almost 100% triglycerides like your skin's lipid profile and none of the lipids contain phosphorus. Your skin has no phosphorus in it and is programmed to keep phospholipids out. This is why petroleum and many plant based oils stay on the surface and clog pores. Emu Oil does more than just hydrate skin it’s packed full of nutrients and is able to deliver them deep where they’re needed. It contains collagen, elastin, anti-oxidants, vitamins, minerals, enzymes and more to help stimulate the collagen fiber network to regain tone, firmness and elasticity. Studies have shown that emu oil applied twice a day for a 14-day period can plump skin up to 30%, with an overall group average of 14%. This is extremely helpful for older people with thinning skin that bruises and tears easily. Emu Oil contains compounds called eicosanoids that trigger your body to increase blood flow and oxygenation down to the cellular level. Eicosanoids affect cell permeability which allows oxygen to get into cells and toxins to get out. Emu Oil contains high levels of ATP (adenosine triphosphate) the energy source your body needs to convert nutrients into the specific compounds necessary for many body functions, in this case new cell division. Emu oil is hypo-allergenic. It’s shown to have almost no side effects. Even at full strength, emu oil has irritation levels so low that they’re the same as putting water on your skin. Emu oil is non-comedogenic meaning it does not clog pores and so will not cause blackheads and pimples. This cannot be said for mineral oil (one of the current, popular carrier oils in cosmetics and rubbing oils) which causes acne outbreaks and skin irritation. Emu Oil allows your skin it to breath. By this I mean expel, as in expel toxins. Your skin is one of your body's major detoxification organs. Blocking this process is just not healthy. Emu Oil is biostatic. Bacteria, virus and fungus will not grow in emu oil. By using our AEA certified pure emu oil you can feel comfortable that you’re not bringing unwanted organisms to open and soft tissues like the inside of your mouth or an open wound. Emu Oil has natural anti-inflammatory properties. Numerous studies have shown that emu oil relieves joint and muscle inflammation. This same mechanism of removing inflammation from tissue helps relief redness and swelling associated with acne, rosacea, rashes and irritations. Additionally, by keeping the pathways open emu oil speeds healing of many inflammatory skin ailments like eczema, psoriasis and other dermatitis and reduces the buildup of scar tissue. The remaining X-factor. As if all of these properties are not enough, there is still another enhanced healing and rejuvenation mechanism that renowned researcher and author Dr. Barry Sears has termed the "X" factor. It is not known if some particular unidentified compounds or specific ratio of compounds are at work, all we know is that it works, and leaves you with glowing, healthy skin.